A WOODWORKER GIFT TOOL ASSORTMENT of well preserved and thoroughly practical high quality tools for the woodworker on your list. All are by Stanley Tools. Included in this grouping are a No. 3 C eight-inch smoothing plane; a No. 4 nine-inch smoothing plane; No. 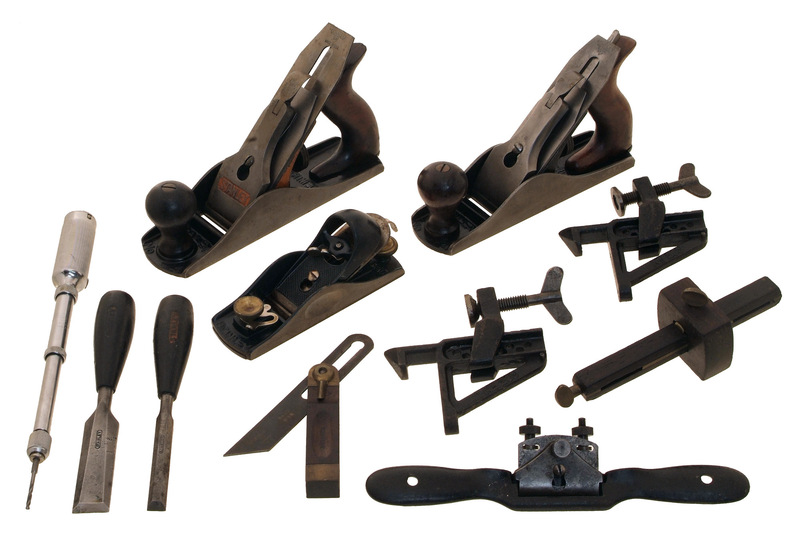 9 1/2 double adjustable block plane; a No. 151 double adjustable spoke shave; a No. 77 rosewood mortise and marking gauge; a No. 25 rosewood body sliding T bevel in the six-inch size; two No. 203 bench brackets; a No. 03-43 push drill with its original bits; and two bakelite handle Everlasting chisels in 1/2 inch and one-inch sizes. All are in excellent condition and can be put directly to use.